Clifford The Big Red Dog is taller than a two-story house and redder than a fire engine! 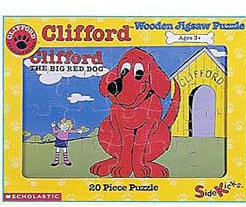 Size (inches): 12.20" X 9.45" X 0.79"
This Clifford jigsaw puzzle is made of high quality, extra thick wood with rounded edges. Contains 32 pieces and can be wiped with a damp cloth when cleaning. Winner of a Parent's Guide Children's Media Award.